Argan oil is known as Moroccan oil, because it is produced from Argan wood in Morocco (Argania spinosa). Its purpose is not only for face, but it has a much wider application. Find out why this natural product is known to the world as a liquid gold. This highly sought after product has a beneficial effect on your skin, hair, used for lip care, feet, nails. The best thing about Argan oil is that I can be used in its pure form, and is also an ingredient of expensive preparations, creams and lotions. It is most commonly used for face and hair in its purest form, and is also used for the care of other parts of the body. Argania spinosa is a tree that can be found only in the south-western part of Morocco, and it has a large, green, round fruit. The fruit is a nut, from which it receives its liquid gold. Nut must be cracked to make production possible. Interestingly, Argan oil for face, hair, skin is still produced in the traditional way. The Argan nut breaks stones, grinds the core of the fruit, and the mixture is compressed by hands and squeezed until the final product is received. For one litre of Moroccan oil it takes about 20 hours and about 100 kg of Argan fresh fruit. Therefore, Argan oil is still at a high price, especially in cosmetics. Argan oil is important in the diet because of its high nutritional value, containing unsaturated fatty acids and vitamin E, but because of its high price, mostly it is used for skin and beauty. Tocopherol (vitamin E) is probably the most important ingredient, since the oil has antioxidant properties it is important in the care of the skin, and in the diet. It also contains carotene, which is essential to protect you from the sun rays, therefore, Argan oil has an important role as a sunscreen. As a solution for eczema, dry and inflamed skin, irritated skin, acne, increased secretion of sebum Argan oil for face is perfect. Liquid gold also helps to harmonize the complexion, skin tightening and wrinkle reduction, it regenerates and rejuvenates the skin. Argan oil is suitable for all skin types. Argan oil for face is most often used for moisturizing and softening of the skin. It is easily absorbed and does not leave the skin greasy, so it makes one excellent natural cream not only for the face, but for the rest of the body as well. Argan oil can also be used for the care of the neck and other parts of the body in need of care and skin hydration. Usage is simple, and is mainly used twice a day (morning and evening), so a drop or two of pure Argan oil, mildly heated (warm, not hot) is enough to put on a face that is still wet from washing, rub in a circular motion and leave it on for the skin to absorb it. In addition to its excellent effects as moisturizing agent, Argan oil works great as an anti-aging product. It gives the skin a youthful glow, reduces the visibility of wrinkles, restores skin elasticity and leaves the skin fuller and softer. The application is the same as for hydration, two drops on a clean damp skin massage in the morning and evening. Argan oil works to regulate the secretion of sebum, which causes the appearance of acne, so use of Moroccan oil can prevent the occurrence of new acne. The presence of vitamin E is an antioxidant that helps to remove dead and damaged skin cells and influence to create new one, so acne scars fade and slowly disappear. Since Argan oil for acne does not leave a greasy track, it helps keep the skin hydrated (acne-prone skin is often dried through various aggressive preparations to combat acne), and again helps the skin to be purged in a stunning, natural way. Mix the ingredients in a bowl, then apply it to cleansed dry face and let it sit for 10 minutes. Rinse with warm water. This mask will restore freshness and softness. We have already mentioned that Argan oil for face has an excellent moisturizing effect, in addition it reduces the itching that often occurs in dry as well as flaky skin. Dry skin does not produce enough sebum, which leads to disorders of maintaining its moisture. Argan oil can lead to the normal secretion of sebum which is much important if you want to keep your skin healthy. Argan oil for face and skin is a 100 percent natural product so the risk of sensitive skin reactions is much smaller, but of course you should always test the product on a small area of ​​skin before using it, in order to avoid allergic reactions. Argan oil is used in eczema, psoriasis, dermatitis and redness that is often associated with this type of skin. Healing effects of Argan oil are reflected in the anti-inflammatory effect, the presence of antioxidant substances, vitamin E.
Oily skin produces more sebum to compensate for the lack of moisture, leading to acne. Argan oil hydrates the skin, reduces the need for sebum secretion, and thus reduces the likelihood of new acne. Here is how Argan oil helps with combined and mixed skin. Combination skin is popularly known as the T zone. It manifests itself in a way that some parts of the face are dry, and other are greasy. Mostly greasy parts are the nose and forehead. Regular use of Argan oil can balance the skin, because of increased regulation of secretion of sebum and solve the most important problem for the combined skin. Antioxidant property of Argan oil is credited for its healing effects that can be used with irritated, chapped skin, damaged, or even with burns. It is best to use it as a preventive agent for dry or irritated skin, but also it can be used to accelerate the healing of damaged skin. Argan oil for skin reduces redness and inflammation, relieves pain, and speeds up the recovery. Rubbing a few drops of Moroccan oil on the affected area of ​​the skin will speed up the recovery process and alleviate an uneasy feeling. Property of Argan oil to soften and hydrate the skin effectively can be used in the care of dry hands, cracked heels, brittle nails and dry chapped lips. After treatment with liquid gold, the skin remains supple, soft, nails are stronger and healthier, and lips are soft and lush. Before bedtime it is recommended rubbing Argan oil on cuticles, as well as hands and feet. For enhanced foot treatment it is recommended to put on socks after the skin absorbs Argan oil. Lip care is very important, especially in the winter time when they may be cracked and painful. The treatment is simple rub it like a lip balm, but be prepared to wipe the excess of it. Argan oil can be added to a warm bath or body lotion, and thus to further nurture the skin of the body. Argan oil can also contribute to the removal of stretch marks and prevent them to occur in pregnancy. Makeup can be successfully removed with Argan oil. This is certainly an important step in facial care. Argan oil is particularly effective for removing eye makeup, mascara and liner, because there is no strong reactions on eyes. Since there are hydrant properties after removing makeup it does not require additional skin care. Argan oil makes hair softer, silky and shiny. There are a couple ways you can nurture your hair with this liquid gold. Read below how to do it. For hair care, Argan oil can easily be applied after washing. Argan oil restores hair softness and gives it shine, restoring the damaged parts, but can also affect the improvement of growth. Vitamin E which is in large quantities in Argan oil affects its healthy growth, because it contains antioxidants affecting the formation of new cells. 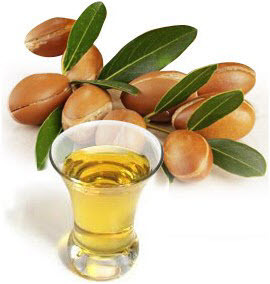 Argan oil penetrates the pores of the hair follicles, so that it affects the elasticity of the skin and nourishes it. It is used for eliminating dandruff it you rub it twice a week before bedtime and leave it to work. Argan oil will affect the secretion of sebum and prevent the formation of dandruff. Its moisturizing effect makes the scalp healthy. Healing effects of Argan oil can be immediately seen, because the hair becomes brighter, easier to shape and comb. Moroccan oil does not irritate the scalp, and even cancels adverse effects of chemical agents that treat the hair. It is often used in its pure form in order to obtain shiny, soft and healthy hair, here are a few ways you can use it. Argan oil for hair is often the main ingredient of shampoos, because it moistens gives strength and shine. This is the solution for people who struggle with dry and brittle, and hair that is damaged by dyeing and various chemicals. A shampoo is great with Argan oil as an ingredient, you can use an ordinary shampoo, no extra steps in daily hair care. This is an ideal method for the recovery and care, because with every washing the hair becomes stronger and brighter. Argan oil can be used as a balm that is not washed, because it leaves the hair greasy, and gives her a sense of soft, silky feeling and lustre. When treated with Argan oil, the hair is easier to comb, preventing further damage. Moroccan hair oil is easy to use, simply apply a few drops of oil on the palms, spread and then comb damp hair with your fingers. The easiest way is to do it after washing, when the hair is wiped with towel and a little dry. Feel free to rub Argan oil to nurture the scalp and improve hair growth. To provide in-depth hair care, you can apply a greater amount of oil, which will act as a mask. For hair, apply a greater amount of oil, massage well and put on a towel as not to soak the pillow with oil. Sleep with a towel on your head and in the morning wash your hair regularly with shampoo. This in-depth nutrition will result in an exceptional hair shine which will restore vitality. It is best that this treatment is 100 percent natural, and not treated with heavy chemicals. Mix in a bowl and apply on the hair. Give it a good massage and wrap in a warm towel. Mask should be left to work for half an hour. Then wash your hair with a shampoo. After this treatment the hair will be stronger, softer and shinier. If you need to style your hair in a hurry, Argan oil is an excellent solution. It will give the hair shine and hair will not be full of static. Also Argan oil for hair can also be used for straightening and styling, as it prevents damage from heat, and further nourishes the hair. It is used much like a balm, just as the hair does not have to be wet. Simply rub a few drops with your fingers in your hair, you do not have to use it much, a few drops is enough. I have used Argan oil as well as products based on it and I can tell you that I am very happy ... I can tell you that during pregnancy I did not get stretch marks, because I applied Argan oil,.˝ Theodore M.
Argan oil has a phenomenal performance ... It nourishes the skin like no other product. ˝ M.S. For years I have used Argan oil for face exclusively acquiring it from Morocco, and it really is a liquid gold. D.I. Argan oil for hair was also used by many, and this is their experience..
"I love this product. It does exactly what it says. It hydrates and does not grease the hair. I love how my skin shines, and that hair remains silky and soft after use. I will certainly continue to use it. K. M.
I have long have problems with dry and electrified hair, because my hair began to paint, and the situation only worsened. I started to despair and I sought after a solution on the Internet. I must say that I was sceptical, because I did not have good experiences with balms and serums that I previously used, but I have to say that I am more than satisfied with the result of treatment with Argan Oil! After the first use the hair became softer, brighter and does not contain static. I'm really happy with the results, and although it is a more expensive solution, it really is worth it, because it is natural and has a fast effect˝ W.T. Wonderful thing. I use Argan oil for hair and face. It is easily and quickly absorbed. I gladly recommend it to everyone. Use a few drops for the treatment so that one bottle lasts enough. B.S. Where to obtain Argan oil and what is the price? Argan oil for hair quickly replaces other oils on the market that are used for treatment. It is sought after because of its beneficial effects, but unfortunately the offer is small, but the price of oil is unfortunately high. For a bottle of 50ml you need to allocate the sum of 24-26 dollars, depending on the manufacturer. The favourable things is that you only need a few drops of this liquid gold to start the recovery of hair and skin. If you have a problem with damaged, dry hair, and dandruff appears, Moroccan oil is right for you. More and more manufacturers are trying to sell lower-quality products at a higher price, a product that contains a very small percentage of Argan. The price for the "right oil" we already mentioned. Many of Argan oils are diluted and have been made in the Far Eastern countries in the lab. The content of Argan oil in them is small, while the rest is a synthetic oil and hazardous chemicals. contain nickel, artificial colours and fragrances, so it can be used by people who are prone to allergies to many cosmetic products. How to know if you are buying a real Argan oil?